I don’t think I’ve ever heard an audience cheer so loudly for an announcement so unremarkable, but the crowd at Hi-Rez Expo are clearly excited. 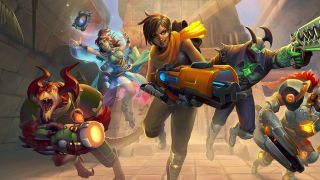 As part of its Hi-Rez Presents briefing, Paladins studio Evil Mojo has just announced that full cross-play and cross-progression is coming to the hero shooter across PC, Xbox One, Nintendo Switch, and “future platforms when they’re available” (a.k.a. PS4), and those seated around me are visibly elated by the news. And the shouting isn’t about to die down anytime soon. This will be the stage for the Paladins World Championships, a global eSports tournament amongst the best Paladins competitors in the world, with a prize pool of over $300,000. For a shooter that, two years ago, was being written off as nothing more than a shameless Overwatch effigy, the sight of hundreds rapturously cheering at non-stop rounds of matches for three consecutive days is as impressive to me as it is dumbfounding. But back in 2016, when Paladins had just released as a free to play game on PC, you could admittedly understand where those accusations were coming from. A multiplayer hero shooter with a colourful art style and diverse cast of playable characters, Paladins had an eerie number of very specific similarities to Blizzard’s recently released contemporary, particularly when it came to its roster of “Champions.” One character in the game, Fernando, is a medieval themed tank hero who can charge at enemies or deploy a shield to protect his teammates just like Ovevrwatch’s Reinhardt, while another, Makoa, uses a hook and chain to reel victims in for a quick kill, aping the exact same play style as Roadhog. It doesn’t end there, either; Paladins features heroes with striking resemblances to Overwatch’s Pharah, Tracer, Mei, Widowmaker, Reaper, and more, hence the public mockery two years ago. If Hi-Rez’s intention was to goad Blizzard into filing a lawsuit, it was doing a damn good job of it. But no such lawsuit materialised, and the angered comparisons soon died down, with the converted either adopting Paladins as their full-time hobby, and the detractors moving onto games they actually enjoyed playing instead. Fast forward two years later, though, and Paladins is looking healthier than ever. Finally free from having to defend itself from those incessant comparisons, the game has come into its own as Hi-Rez Studio’s fast paced development and eSports focused agenda has endowed it with an identity that stands apart from anything else on the market. For one thing, Paladins now has a whopping 40 Champions in its roster, all of which can be accessed by those who purchase the affordable Champions Pack for £24.99/$24.99. As a result, Hi-Rez has used the opportunity to prove its talent for creative character design beyond the launch roster’s unfortunate equivalence to Overwatch. One hero, the ghost pirate Dredge, wields a handheld howitzer entangled with a live squid, who reloads the gun with all eight of his tentacles. Meanwhile, Moji is an impish wizard mounted upon a two-headed reptilian familiar, the respective heads of which act as the player’s dual-wielding weapons. The sheer visual and tactile variety of the characters in Paladins in 2018 is a thing of beauty, not to mention the fact that it gives players more choice than ever when it comes to selecting their champion at the start of each match. This extensive roster, along with a customizable card system that allows players to customise each hero with their own subset of perks and stat boosters, means Paladins almost operates like a hybrid between a hero shooter and a MOBA, which makes sense when you realise that Smite remains Hi-Rez’s most successful game by a country mile. Earlier this year, the studio founded its own separate subsidiary company Skillshot, dedicated entirely to cultivating the eSports scene within all of its games, organising tournaments, setting up scholarships and sponsorships, and working with pro players to facilitate the best possible experience for competitive battles. While other studios are still struggling to figure out how to juggle eSports with active development, Hi-Rez and Skillshot seem to be comfortably finding success in both, leading the industry through its growing pains as a result. The sheer visual and tactile variety of the characters is a thing of beauty. To be clear, with its garish menus and an obtrusive monetisation overlay, Paladins still too often comes across like a budget hero shooter, clearly falling short of the production value that Blizzard is so well known for. But, then again, in terms of pure content, you’re getting much more for your money with Hi-Rez’s free to play title, which now has well optimised ports across PC, PS4, Xbox One, and Nintendo Switch. And at the rate that Hi-Rez continues to curate Paladins with post-launch support, that steady drop of new heroes also doesn’t look to be slowing down.. While I’ll admit that my time at HRX didn’t awaken any previously unkindled passion for eSports in me, I did leave with a new appreciation of what Hi-Rez is trying to accomplish with Paladins. Not only has the game successfully escaped its stigmatised shadow, but its evolving pivot towards competition, customisation, and chaos makes for the perfect spectator sport, evidenced by every adrenalized whoop and cheer from the World Championships’ audience of thousands. Love it or loathe it, Paladins isn’t going away anytime soon.